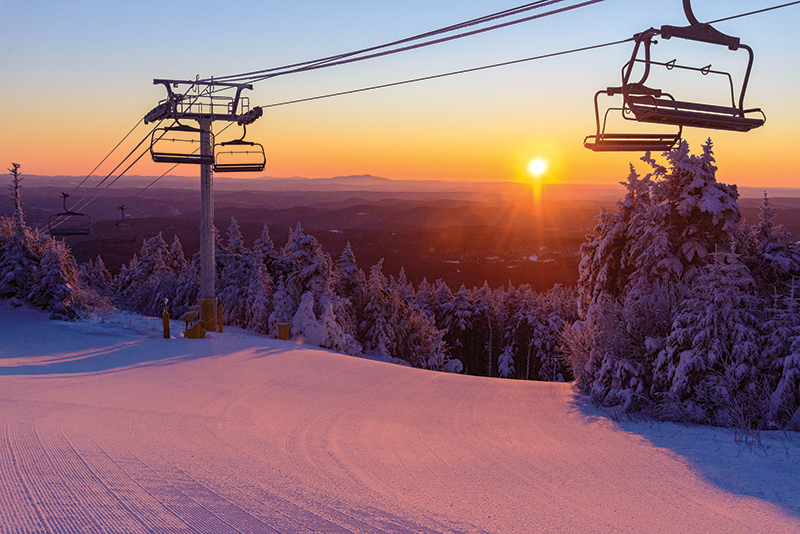 It’s winter at Stratton—my favorite time of year. Everything is so busy from morning to night, always in the best condition and ready for you to enjoy. I AM THE MOUNTAIN. Although I work long hours, I do get a bit of rest during the wee hours of the night as I get tucked in with a white blanket of fresh snow. But I’m up early even before the sun rises, so I can be groomed and be in tip-top shape for you. Most rumples are smoothed out like brushed corduroy, but I do keep a few bumped-up parts for interest. The ski patrol team led by Chris Schilling is double-checking me the very first thing for any unsightly flaws, making sure I’m at my finest for early morning visitors. And as the sun begins to warm me up from the overnight chill, Hubert Schriebl is photographing me, capturing perfect angles, showing me off in the best light. Rising with the sun, I can see Route 30 and the Access Road filled with a steady stream of cars, each with boards and skis on top in anticipation of spending the day with me—I’m just about ready. I am powered up—my gears begin to spin. Guests arrive looking forward to being among the first to have me to themselves. Some have even begun to enjoy me on foot with special gear from local shops such as The Startingate Ski Shop, Norse House Ski & Sport, First Run Ski Shop, Equipe Sport, and Bradley’s Pro Shop. As the day progresses, Steve Truskoski and the safety patrol team are here to keep all in check and, for those in need of a tune-up, a visit can be made to the at-the-ready Stratton Mountain Urgent Care at Carlos Otis Clinic. And as the day wanes, after the last run there is still more of me to enjoy at the Coca-Cola Tube Park, riding on snowmobiles, or at my neighbors at the Village Spa, Sports Center, or Winhall Memorial Library. But my work goes on as I change and adapt with the weather and prepare to greet winter lovers all over again the next day.